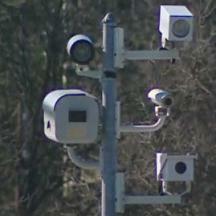 The small town of Chestertown Maryland (Kent County, pop 4740) is currently considering adding speed cameras. The minutes of the December 7th 2009 meeting show that Town Manager Ingersoll introduced a proposed change to the town code for an ordinance to authorize speed cameras. Almost the entire town could legally have speed cameras deployed. The minutes made it clear what the limited extent of human review and local police involvement would be in issuing citations: "Mr. Ingersoll stated that a computer print-out would go to the Police Department who checked off the list and then it was sent back to the vendor for the issuance of citations. He said that the police would make sure that only the proper vehicles were issued citations, citing an example that if an ambulance or fire truck was going over the speed limit, they would not be issued a citation." The minutes state that "the Ordinance would be adopted at the meeting of December 21st and it will become effective January 10th. He said that he would try to bring the contract to the next meeting." The town website does not display the ordinance or show any notice of public hearings at the time of this posting.